Pregnyl 1500 drug IS IN STOCK. Direct shipment from Europe. 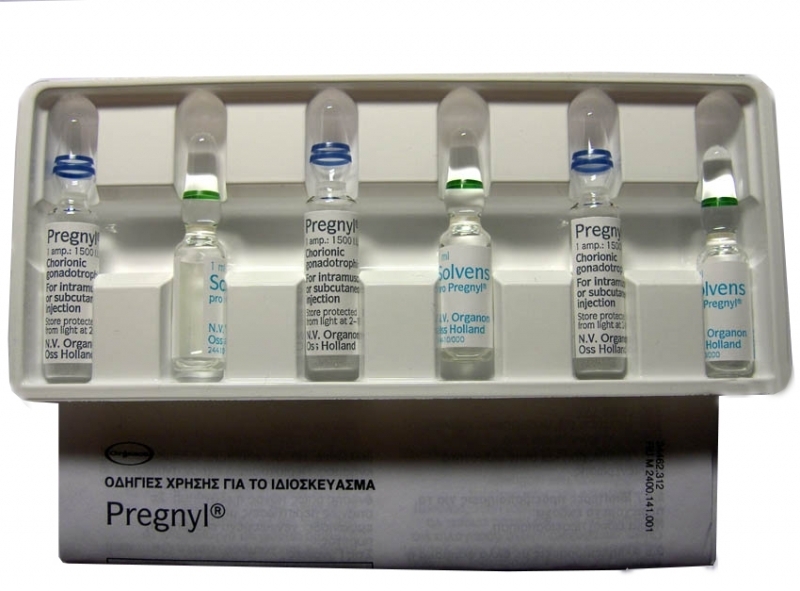 Pregnyl HCG is sent via mail or cash on delivery (payment at receiver). Pregnyl is a hormonal drug that is designed for testosterone production at male athletes and for estrogen and progesterone synthesis stimulation after ovulation at female athletes. - Retarded sexual development conditioned by weak gonadotropic pituitary function. - in a combination of assisted reproductive technology for preparation of follicle to paracentesis. Pregnyl may be purchased in the form of powder in order to prepare the injections. The powder is placed in ampoules if 1500 and 5000 ME. The set includes the solvent for injection preparation. The set contains one ampoule (lyophilisation + solvent). The preparation is injected intramuscularly. The prepared solution cannot be stored. Dosages are appointed individually by the treating doctor, depending on many factors and the expected reaction to Pregnyl administration. The unsolved drug is stored in a refrigerator, in a dark place at a temperature of not lower than +2 degrees. The drug may be administrated for infant patients (up to two years). However, definite caution is necessary. The risk of precocious puberty exists when it is administrated by teenagers. It is not contraindicated at pregnancy. But Pregnyl HCG shouldn’t be injected during breastfeeding. It should be appointed with care at a migraine (also in anamnesis), epilepsy, renal dysfunction, latent or expressed cardiovascular insufficiency arterial hypertension. In such cases continuous and attentive control of the treating doctor is required.